The Friedrich Naumann Foundation (FNF) is presently conducting an assessment of it educative and training programs in the Philippines. 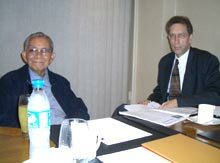 For this purpose, FNF’s Regional Director for East and South East Asia, Mr. Hubertus von Welck, and the Head of the Asia Department at the Foundation’s headquarters, Mr. Siegfried Herzog, have come to Manila for a series of informative talks with senior Philippine officials associated with organized liberalism in the country. For nearly 20 years members of the Philippine liberal family have been the main beneficiaries of the Foundation’s educative projects in this part of the world. Following the recent developments in the liberal family, the Foundation has decided to conduct an assessment of its programs, with the aim of evaluating its contribution to the promotion of liberalism thus far and assess what could be its role in the future. During their visit, the Foundation’s officials and Resident Representative Dr. Ronald Meinardus held informative meetings with political friends and partners. Among them were former Senate President Jovito Salonga, Senate President Franklin Drilon, Senate Majority Leader Francis Pangilinan, Solicitor General Edgardo Nachura and Mayor of Manila Jose Atienza Jr. The Foundation’s representatives also held informative meetings with the boards of two longtime Philippine partner organizations: the National Institute for Policy Studies (NIPS) and the Kabataang Liberal ng Pilipinas (KALIPI), the Young Liberals of the Philippines.